Just finished up five days of exploring the urban and suburban environment of the Chicago region with my intrepid squad of @RooseveltU students in our one-week-intensive Sustainability Studies 360 course, Writing Urban Nature. 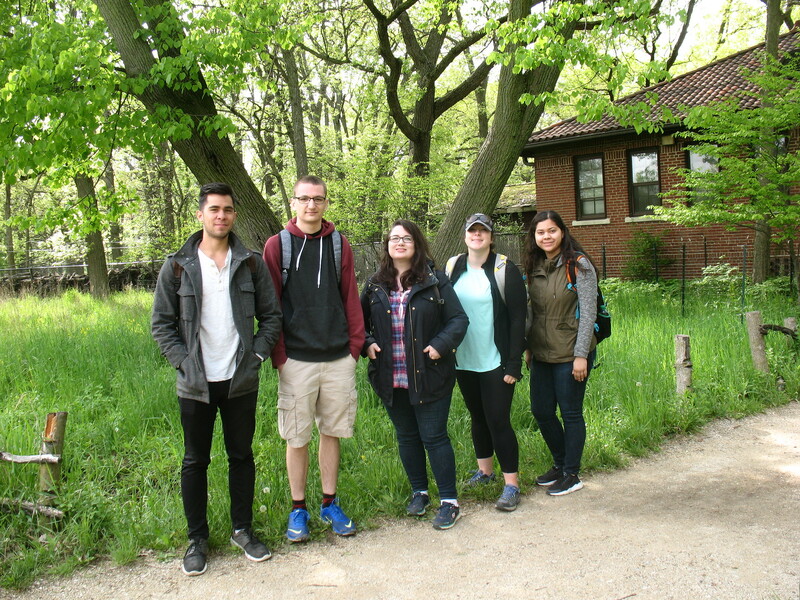 Here they are at the North Park Village Nature Center on Chicago’s NW Side, one of the many sites we visited this week in Chicago, Schaumburg, and Will County. Pictured from L to R here are Austyn (oboe major), Tom (psychology), Alicia (sustainability studies), Grace (wildlife biology), and Denise (biology). Notably, Grace joined our group as a student-at-large from Western State CO University, enrolling in this environmental humanities class via the Resilience Studies Consortium of US colleges and universities. The students now are working on creative non-fiction essays as part of our Writing Urban Nature online project, est. 2015. This entry was posted in Chicago, Classes, Education, Field Trips, Humanities, Roosevelt, Students, Sustainability, Urban nature. Bookmark the permalink.